While fire damage can ruin a home or office, smoke damage can be just as damaging to a structure and valuable contents. Smoke can cause heavy damage to the interior of a building or home, causing a permanent discoloration of the walls, ceilings, floors, and allow heavy smoke odors to penetrate into several items. Smoke particulates can be 1 micron or smaller, which means they can penetrate fabrics, carpet fibers, porous surfaces and your lungs. Soot is smoke residue that is composed of substances that burned in the fire including plastics, foams, fabrics, carpets, wood products, synthetic fibers or wool. 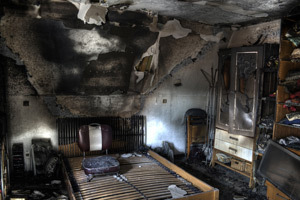 It is crucial that you call in a fire damage restoration team when your property experiences a fire damage disaster and there is a considerable amount of smoke and soot on the walls. Otherwise, it is possible that the smoke particulates can get into your lungs and cause you significant respiratory health problems. This makes smoke damage cleanup always a job for a professional. The experts at ServiceMaster Cleaning and Restoration Services have all the answers for smoke related damage. With the correct tools and cleansers, our technicians will be able to restore items and structures from smoke damage and its lingering smoke odor. Trust ServiceMaster Cleaning and Restoration Services for smoke damage restoration for your home or business.